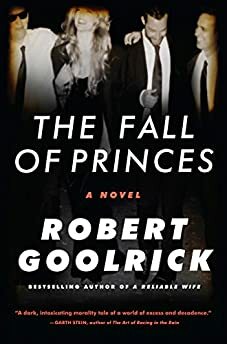 Largehearted Boy: Book Notes - Robert Goolrick "The Fall of Princes"
Book Notes - Robert Goolrick "The Fall of Princes"
Robert Goolrick's novel The Fall of Princes is a pitch-perfect account of one Wall Street trader's rise and fall in the New York of the 1980s. "Goolrick’s stellar prose infuses this redemption story with a good deal of depth and despair, making it read like the literary version of The Wolf of Wall Street." I really only like rock and roll for its power to break your heart. To put together a retro soundtrack for The Fall of Princes, which takes place in the '80s, would have left me with an endless list of dance remixes, played to the sound of crunching amyl ampules under steel-toed boots, or the greatest hits of Anita Baker, played to the sound of cocaine being chopped on the surface of a mirror. I couldn't have written a word to it, and, more importantly, as much as I was burying myself in nostalgia for the time, I couldn't have listened to it. It was my youth, which is over, and I couldn't bear to raise that particular corpse again. Instead, I listened to music that broke my heart in a regular, bearable way. I wear sadness like an old sweater, and sad music is my eternal heartbeat, except for every now and then a big, booming song that knocks me in the head and shakes me into what resembles a fury of excitement. These songs are often by the Kings of Leon, but there are occasional surprises. The Decemberists – "This is Why We Fight" – How can a band I dislike so much produce a song that is a piece of fierce, tenacious and unforgettable perfection? Revolutions have been started on less passion. "When we die/We will die/ With our arms unbound/ This is why/This is why/Why we fight/Come hell." From first note to last, it is exquisite, and in their canon there is nothing else like it and I don't expect there ever will be. But, if it is never to be repeated, it is enough. The National – "Sweetie you don't look so good/ Your bottom lip is bleeding/ I cut it on your collarbone/ Go on, go back to sleep." If I could be anybody in rock, I would be Matt Berninger, so I could stand in front of thousands of people and sing those lyrics, from "Bitters and Absolut"; both concerned and cruel, mysterious and masochistic, they comprise one of the most intriguing openings to a rock song I've ever heard, since "Impossible Germany/ Unlikely Japan." In the wistful and bitter department, The National never disappoints. The people in my book are the people these lyrics describe, so damaged, and so often damaged that the wound is taken for granted, sweetie. Go back to sleep. Olafur Arnalds – "For Now I Am Winter" – If you want to wallow in romantic self-pity and regret, Arnalds is your man. He's made a lot of music, all of it haunting and soft and lovely, but this is his first album on which he has included songs with lyrics, and they wrench the deepest feelings out of your hip-hardened heart. The music is like a wisp of smoke from a cigarette late at night, after the party's over, visible but not tangible, the taste of ice-cold vodka still on your tongue. The people are gone. You are ultimately and finally alone. Possibly forever. The eternal winter begins. Francoise Hardy – "Message Personelle"- The It girl of a generation you don't remember, she was an international pop star and fashion darling, wearing, one evening, the most expensive dress ever made – Paco Rabanne's chain mail mini dress made of gold encrusted with diamonds. In 1970, she walked away from everything. Just in time for the writing of Princes, she returns, older, sadder, still an icon of fierce lost sadness, with the message of lost love. God, she's beautiful, a muse to Damon Albarn and the novelist Michel Houellebecq, and you know, you just know, looking at the video, a triumph of sadness and brutal honesty, or listening to the song as you write songs about your own lost youth, that she knows, she just knows everything you've been through, and holds you in her broken heart. She may be writing to say goodbye, but she knows that nothing is ever really gone, every love is always a new hurt and every wound is fresh. Tired Pony – "That Silver Necklace" – I don't understand why Snow Patrol never made it in the US. They're a great, literate, extremely moving band that fills stadiums all over Europe. Gary Lightbody, took some time off and created Tired Pony, a sort of superstar band that first appeared with a brilliant video of a song called "Dead American Writers." I could watch the video a thousand times. In two albums, they have given us a tremendously moving palette of music, recently backed by, oddly, Minnie Driver. In "That Silver Necklace" the singer speaks to his girlfriend of a piece of jewelry he once gave her, and wonders if it hurts her to wear that thing, as he puts it. The band has a grace and a poetry that is hypnotic, the poetry is real, not the fatuous schoolboy scratchings of most rock bands. In the middle of a song of yearning love comes this: "We are not the lions of the daylight, daylight/ We are more like wolves in dead of night/We are more the ravens in the schoolyard, schoolyard/ And all the larks about to sing." It's amazing. I don't care what it means. Frank Ocean – "Sierra Leone" – Love's yearning heart. Love's lost opportunities, and the striving for love's ideal (Sierra Leone, in this case), who is not moved, who has not been there on that uncertain stairway. Frank Ocean approaches loss and sorrow with the gentlest touch, like a doctor who is telling you you're going to die, or a priest who is placing his hands on your head and pronouncing absolution. There is something uniquely sad and lovely in his work, and, in this song in particular he reaches straight or the heart and makes every attempt to make a hopeless situation better by the sheer force of his own loveliness. Ane Brun – Start anywhere. Listen to Songs 2000-2013. Listen to the whole thing without stopping, all thirty-two songs. "I'm just too romantic, Hey Ho My lover will go/ Without any sense of strategies/ Hey Ho/ My lover will go." This is romantic sadness at a very high peak of sophistication, the words of a woman to whom it has all happened before, and who looks at romantic loss not for the first or last time. She also sings of the most wonderful endearing love – "Don't ever leave, that is what you asked of me, do you know, what it means, when you plead?' It won't do us no good, she sings, knowing that such foreverness doesn't even happen in romantic songs. This on was, unfortunately, used in a mawkish television commercial. She deserves a better listen. Emeli Sande – "Heaven" – When Ane has left you near death on the floor, let Emeli lift you up. OK, so it's a disco song. She's the Donna Summer for the new millennium. But I'll take it. When she slams into her first song – "Do you recognize me?" – the delight just floats through the room like pot smoke in 1969. "Oh heaven, oh heaven, I wait with good intentions, but the day it always lasts too long." A song of lost love, again, but such by an extraordinarily beautiful woman who, you can tell, has and will, pull herself up by her bootstraps one more time. Knock her down, Emeli gets up. Carl and the Passions – "Cuddle Up" – One of the most beautiful rock songs ever written. I heard four bars of this song in a Twyla Tharp ballet based on The Beach Boys work, and I remembered it with such clarity twenty-five years later, that I had to dig and dig and consult my friend Margot Ravis, who knows everything, until I found it again. It did not disappoint. Monumental beauty of such gentleness and kindness that your heart cannot help but be moved. Bat for Lashes – If Florence Welch would just calm down, she'd be Bat for Lashes and sing "Laura." It's a song about the comfort that one friend can give another when everyone else has left. Simple, lovely. "You can't cry/ put your glad rags on and let's sing along/ to that lonely song/ You're the train that crashed my heart/ You're the glitter in the dark/ Laura, you're more than a superstar." When I write, I am never without music. It helps me concentrate. It connects me to a world of wonders. I sit and make a list, shocked to find that Sam Herring and Future Islands, so much a part of the last several years' playlist, is not on it. Shocked to find Jason Isbell missing, gone also London Grammar, whose Nightcall starts with a line that is pure dread, sung by the beautiful Hannah Reid who makes you feel that she knows you, has always known you? How can you make a list and not start with Dusty in Memphis, surely one of the best albums ever made. How can I not say that anybody who hasn't heard The Tallest Man on Earth has missed a magical experience and that, when it comes to sorrow, nothing matches his song "There's No Leaving Now?" I live alone. I have always lived alone. Music is not just my soundtrack, it is the fabric of my life. The empty room, me, the computer out of which the story pours, on a good day by itself, on a tough one only with the use of a sledgehammer and brute force, and music, my friend, my lover, my sorrow, my memory, my exultation. My forever.